The Pound surged to its highest levels since last September as reports came out saying that PM May was open to delay the Brexit date. Later in the day, she spoke before the Parliament, repeating that she would prefer to leave on March 29, yet if her deal doesn't get approval, she is willing to consider a short extension of three months. Investors’ bullish sentiment continued as the market feels the possibility of a hard Brexit is getting slimmer. In economic news, today the UK will release the Gross Mortgage Approvals, which could impact the price in the short-term. 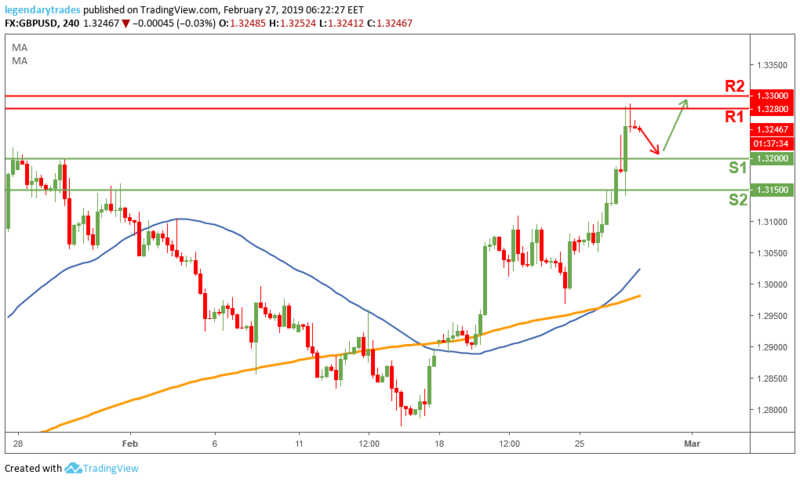 The Pound kept breaking to new highs in yesterday’s session when price broke above 1.32 resistance and went on to test 1.3280 (R1). Price could pull back towards 1.32 (S1) to retest a previous resistance level as a new support. If the bulls protect that level, we could see another push to the upside retesting 1.3280 (R1) and possibly 1.33 (R2).